On 14th May 1948, 70 years ago today, David Ben Gurion declared the independence of the State of Israel. 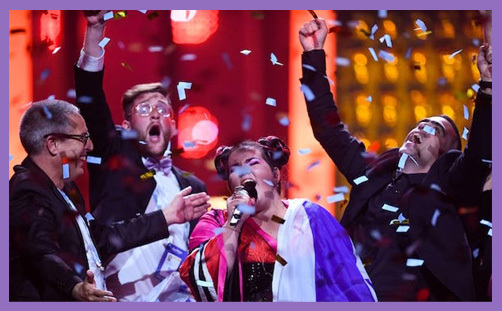 In celebration of this momentous anniversary, God raised up Netta Barzilai, and lo, she won the Eurovision Song Contest 2018, though quite what Israel was doing competing in a European competition is unknown (a bit like Australia, and Armenia…). In further celebration of this momentous anniversary, President Donald Trump has decreed that the US Embassy shall be inaugurated today in Jerusalem, the eternal capital of Israel, as a seal of the unbreakable bond of friendship between their countries and their peoples. “Thank you! I love my country!” cried Netta at her point of victory. “Next year in Jerusalem,” she added poignantly, with a hope that has echoed in every Jewish heart for centuries, and a prayer which has endured through millennia of weeping by the Rivers of Babylon. Zionism is the Jewish dream of restoration, return and renewal. Israel’s rebirth 70 years ago was a joyous event. To some it represented a safe haven to be Jewish in a Jewish land without fear of persecution. To others, the sovereign hand of the God of Abraham, Isaac and Jacob fulfilling promises from the Torah and the Prophets was clear to see. Much of the world rejoiced with them. However, not everyone was pleased. Many Arabs, including those whose own nations were formed in the same period, call Israel’s national rebirth ‘The Naqba‘ or ‘catastrophe’. The formation of a Jewish state in the region, they claimed, robbed Palestinians of their land; the Jews were portrayed as interlopers. The region’s problems were – and are – routinely blamed on Israel, and criticism goes far beyond Israel’s actions, often questioning the very legitimacy of Israel’s existence. Israel is central to Jewish religious and national identity; it is where Jews are closest to God. It is the one piece of land historically promised to the Jewish people as recorded in Genesis, and the only land where the Jewish nation has ever experienced sovereignty and self-rule, producing a dynasty of kings and visionary prophets from whose quills flowed some of the most treasured writings in the history of the world. Despite attempts by successive occupying powers to expel them, communities of Jews have lived in the Holy Land continuously since the time of Abraham. Since the Babylonian exile, the Jewish diaspora has spread as far as South America, China and Australia. But Jewish ethnic identity, recognised by the countries in which they lived as minority communities, was based on Jewish affinity with the land of Israel and the Jews living there. On 29th November 1947, the United Nations voted to create an Arab and a Jewish State alongside each other in what is now Israel and the West Bank. It was accepted that Israel would have a sizeable Arab minority. The Jewish State was allotted 56% of Mandate Palestine, since the UN correctly predicted heavy Jewish immigration from Europe after the creation of the Jewish State. Perhaps they also guessed that large numbers of Jewish refugees from Arab nations would also need a home. The Jewish Agency, led by David Ben Gurion, accepted the plan. Arab leaders rejected it, and Arab attacks on Jewish communities began at once. Britain announced that her troops would be withdrawn from Palestine on 15th May 1948. Aware that Arab countries had vowed to destroy any Jewish state, David Ben Gurion declared the independence of the State of Israel on 14th May 1948, with borders as stipulated in the UN Partition Plan. Significantly, the Declaration of Independence stated: “We appeal… to the Arab inhabitants of the State of Israel to preserve peace and participate in the upbuilding of the State on the basis of full and equal citizenship and due representation in all its provisional and permanent institutions…” Within days of the British withdrawal, 35,000 Iraqi, Lebanese, Syrian and Egyptian troops (led by British officers) invaded Israel. Despite overwhelming odds, and the loss of 1% of the population of Israel, Israeli forces decisively defeated the Arab armies. Israel took territory beyond the UN allocated borders because their territory could not be defended against further Arab attacks. Unsurprisingly, given repeated Arab threats to annihilate Israel, Israeli leaders feared an Arab ‘fifth column’. However, most Arabs who had remained in Israel became Israeli citizens. Jews were also expelled from their homes by Arab forces, for example from Gush Etzion and K’far Darom in Gaza, all built on land purchased legally. And of course Jews were expelled from the Old City of Jerusalem. In addition, 800,000 Jews were forced to abandon homes and businesses in Arab countries. They arrived in Israel with nothing. These are the forgotten refugees of 1948. Both sides committed atrocities. Women and children were murdered by Jewish fighters of the Stern gang and Irgun in the peaceful Arab village of Deir Yassin. Arab fighters took revenge by murdering Jewish women and children in K’far Etzion and members of a convoy taking medical supplies to Jerusalem’s Hadassah hospital. With 3,000 years of continuous presence in the Holy Land, how can Jews be characterised as interlopers in the region? After World War II, Palestine was the only place that many European Jews, robbed of their homes and families, could go. A further 800,000 Jews from Arab countries fled or were expelled in pogroms and were absorbed into the Jewish state in the years following Israel’s Independence. Later, Jews from all over the world – Africa, India, China, the old USSR, as well as the USA and Europe, made aliyah to Israel. Modern Israel combines the best ideals of the west – democracy, liberty, openness to debate and criticism as well as new ideas in technology and the arts. Such ideals are much needed in the region. Given the ferocity of comment in the Israeli press and the intensity of debate and moral self-criticism which so characterises discussion in Israel – so rare in public life today – the ongoing global attacks on Israel are profoundly depressing and disturbing. God promised Abraham that his descendants would have a land, and would be a blessing to all the nations of the earth. The Anglican Friends of Israel believe that modern Israel is a fulfilment of that promise: we rejoice unashamedly at this, Israel’s 70th birthday, thanking the God of Abraham, Isaac and Jacob for the restoration of the Jewish people to their land. And we pray for a just peace for all the people of the region, Jew and Arab – a peace which we believe that ultimately, only God himself can bring. And we thank God that Netta Barzilai, an Orthodox Jew from Israel, can win Eurovision, for she is London in Jerusalem; she is Europe in the Middle East; she is our values and culture; she is the eccentric and eclectic incarnation of our liberty, fraternity and democracy. Happy 70th Birthday, dear Israel. L’Shana Haba’ah B’Yerushalayim.